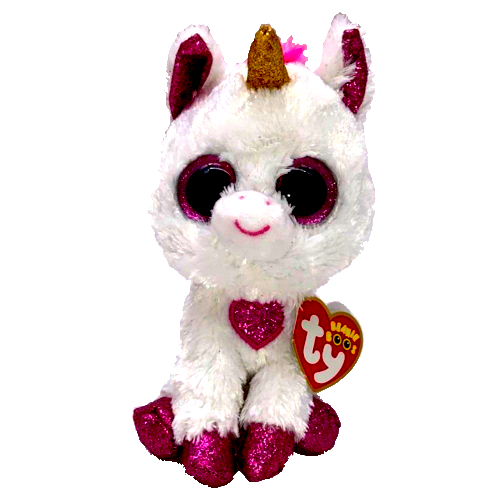 Cherie is a white unicorn with large, glittery pink button eyes and pink embroidered nostrils. She has a bright pink fluffy mane and tail, and a sparkly gold horn on top of her head. On her chest is an embroidered sparkly pink heart. That says I hope we never part. Cherie was released in January 2019. Her Birthday is on 9th February. Cherie appears to be a Walgreens exclusive Beanie Boo. This is the 6″ Beanie Boo version of Cherie. She was also released as a medium 9″ Beanie Boo Buddy.